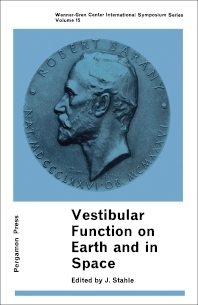 Wenner-Gren Center International Symposium Series, Volume 15: Vestibular Function on Earth and in Space provides information pertinent to the fundamental aspects of vestibular research. This book discusses the problems concerned with space, with emphasis on the importance of the vestibular apparatus in space flight. Organized into 32 chapters, this volume begins with an overview of the mechanisms and processes for creating the chemical composition of endolymph. This text then examines the speculative comparisons between prolonged exposure in a manne weightless space station and in a rotating space station. Other chapters consider the relationships between vestibular nystagmus and degradation of visual acuity when the vestibular stimuli interfere with voluntary efforts to see specific visual detail. This book discusses as well the concepts concerning the distribution of function between semicircular canals and otolith organs. The final chapter deals with the method for selective marking of neurons after axonal transection. This book is a valuable resource for otologists and scientists.